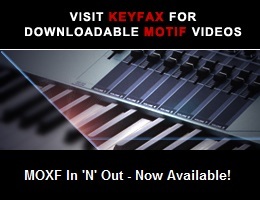 Viewing topic "Motif XF - sampled/mapped Harp Gliss"
I am quite new to the XF8 so maybe my issue is a newbie-issue but I would appreciate any help and I can’t hardly find good stuff in the net! I will play a musical-show and programed 80 patches in performance mode. Now in one measure there is a harp glissando which is impossible to execute manually. So I want to trigger the gliss on one of the keys. This would be the best solution, but it looks like everything I got in Pattern or Song-Mode is impossible to trigger in Performance mode. I re-recorded in pattern-mode the glissando with integrated sampling and it worked. It is there, I can play it. But how do I get this in the Performance mode (as voice f.i.)?? Put the sample in a user voice or a user drum (if you use a user drum voice remember that the keybank of the sample must be C3, then you can assign the sample in the key you want )and then put the voice in the performance. Welcome to the Motifator forum. I presume you have created a Pattern that plays the gliss as you require (if not, please explain). If so, how many different notes are used? Yes, I used the pattern-mode to record the gliss. I simply played and recorded it so there is a bunch of notes. After I re-recorded it as a sample and use it in a waveform. And it’s working; so this method does the job. from the voice or performance mode. Would be easier, especially for corrections.